In partnership with Cancer Care Ontario, the Hamilton Niagara Haldimand Brant (HNHB) Regional Cancer Program (RCP) oversees the delivery of cancer services, including prevention and screening services. Many types of cancer can be prevented, and early detection of some cancers can improve your chances of recovery. Scroll down to learn more about cancer prevention and screening services in the Hamilton and surrounding areas. 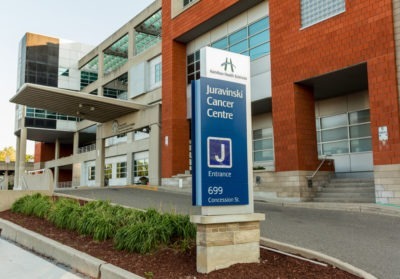 The Regional Cancer Prevention and Screening Program offices are located on the second floor of Lakeview Lodge at the Juravinski Hospital and Cancer Centre. Take the elevators on the main floor entrance, across from the Information Desk at the Juravinski Cancer Centre, to the basement. Turn left off the elevators and follow the corridor until it ends. Go right up the incline until you reach a fork in the corridor. Turn left, following signs for the M Wing (look for the blue line on the wall). The elevator for the Regional Cancer Program office is located on the right hand side. Take the elevator to the second floor. Cancer Prevention and Screening Programs are located at multiple locations across Hamilton Health Sciences and at partner hospitals across our region (visit hnhbscreenforlife.ca for programs and services offered beyond Hamilton). Ontario residents ages 50 to 74 can book their own appointment for routine breast screening. Find breast screening locations here. For cervical cancer and colon cancer screening, talk to your healthcare provider. No healthcare provider? Visit the Mobile Cancer Screening Coach.